Cracking skirmish today, really enjoyed it. Got plenty of kills too which is always a bonus! Good stuff What site did you play at? 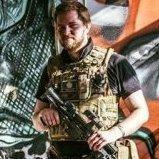 I went to Anerley, Croydon, which is run by Tactical Warfare airsoft. I dont get to skirmish much but when I do I try and make the most of it and thoroughly enjoyed it this time out.